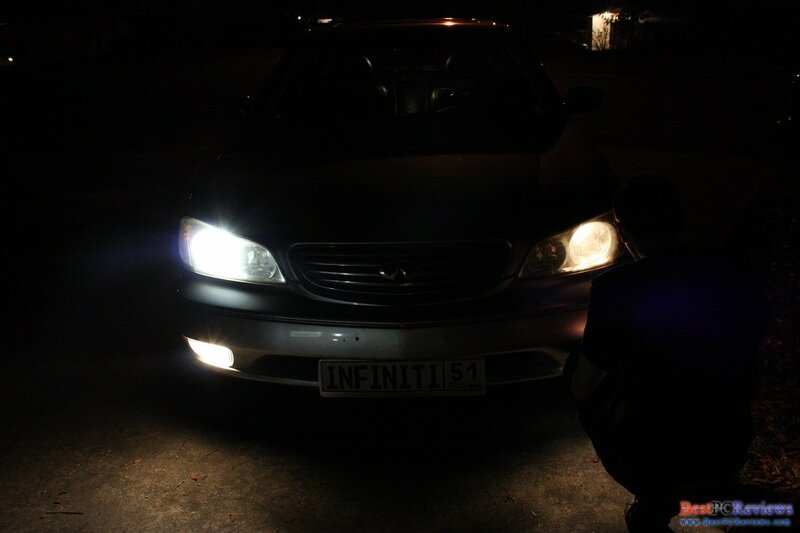 Cars like Infiniti i35 are known for luxury as leather seats, BOSE sound system, and High Intensity Discharge Bulbs. Even though the bulbs are made to last, mine went off after about 9 years of usage. Stock bulbs cost about $150 each, but this guide will show you how to save great fortune of money. On top of the money saving tips, I will show you the easiest way to replace the H.I.D. bulbs. 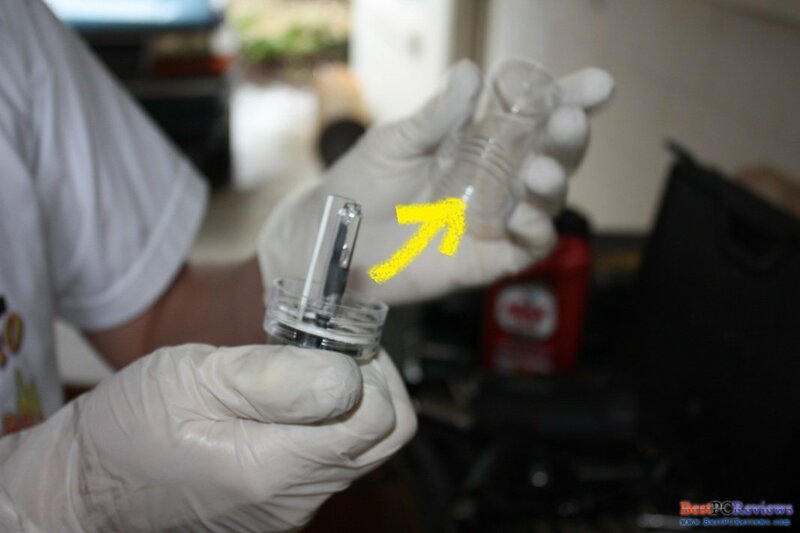 Before we start, if your headlight bulb produces purple color instead of your regular white or blue color; that means that your bulb is going bad. Give it one more week and it will stop working completely, so you might as well replace the bulb. 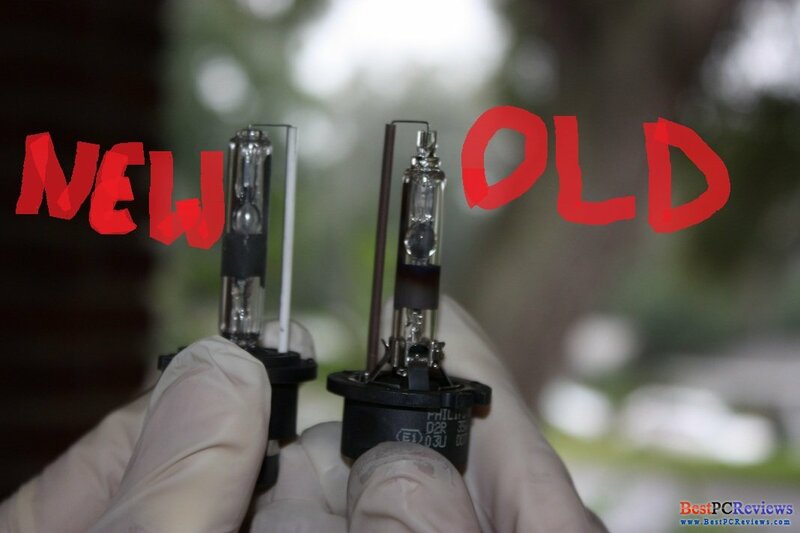 I would recommend you to replace two bulbs at the same time because your replacement bulbs might not be exact same color and also there is possibility that your second bulb will go out within the same year. 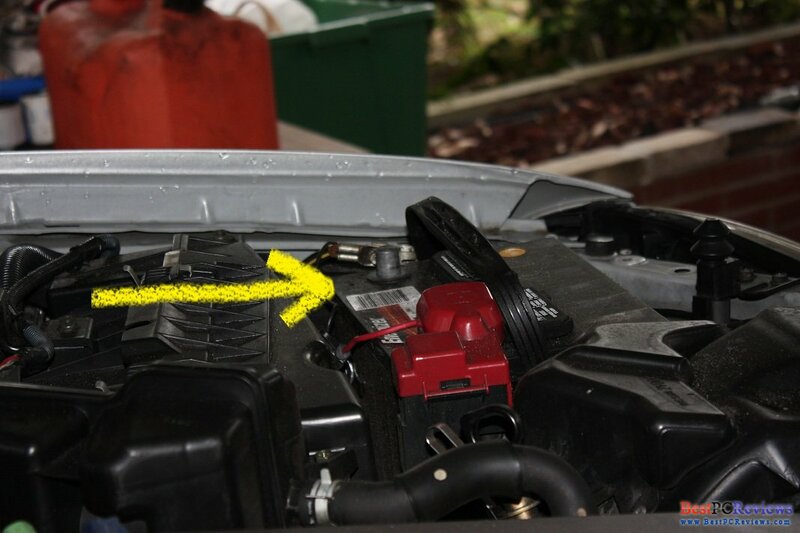 Before you even open your hood, first thing you need to do is get the replacement bulbs. As I mentioned before, the bulbs can be quite pricey, as much as $150 each. However, I found great replacement. XenonLiquidators.com is the place. Here you can read review of these bulbs. Make sure to get D2R size bulbs. 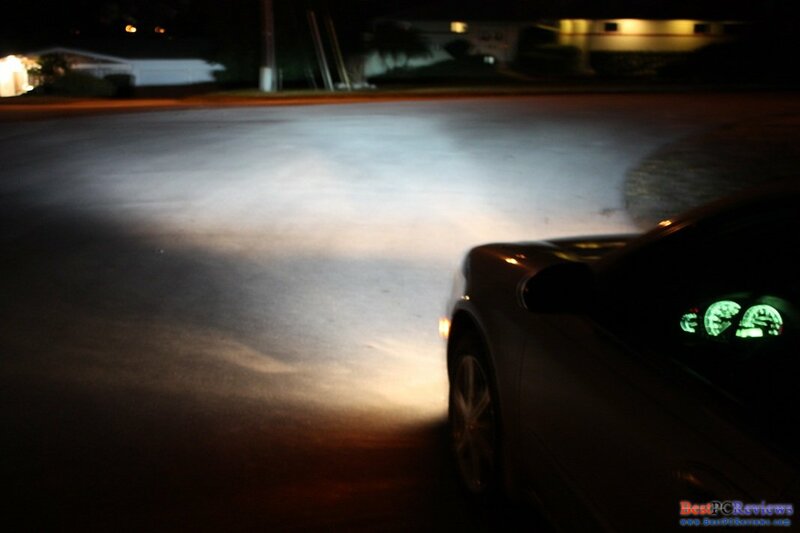 I got myself 6000k bulbs the color is diamond white instead of stock white and they seemed to be a little brighter on my car. These bulbs come in shielded package, which keeps the bulbs safe. Now it’s time to get to your car. I will start from the driver’s side headlight. Before you start, disconnect the negative cable from the battery. 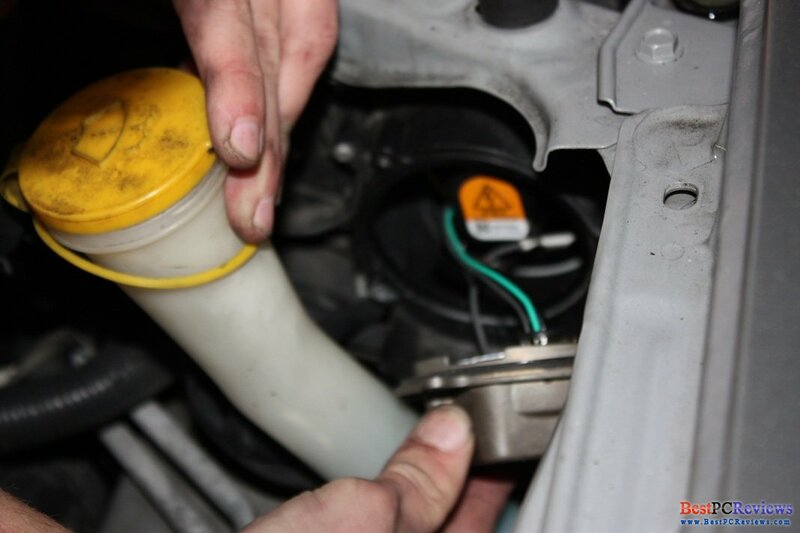 You will deal with high voltage and to protect you and your car it is extremely important to keep negative cable away from the battery. 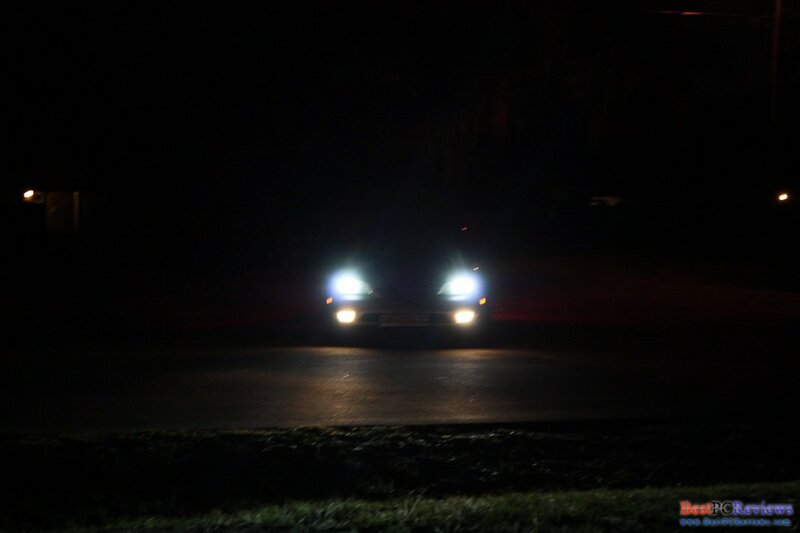 First thing you need to do is take out the headlight. The reason we need to take the headlight out is because it is impossible to take the cover out the back of the light because fuse box is blocking the path to the cover. 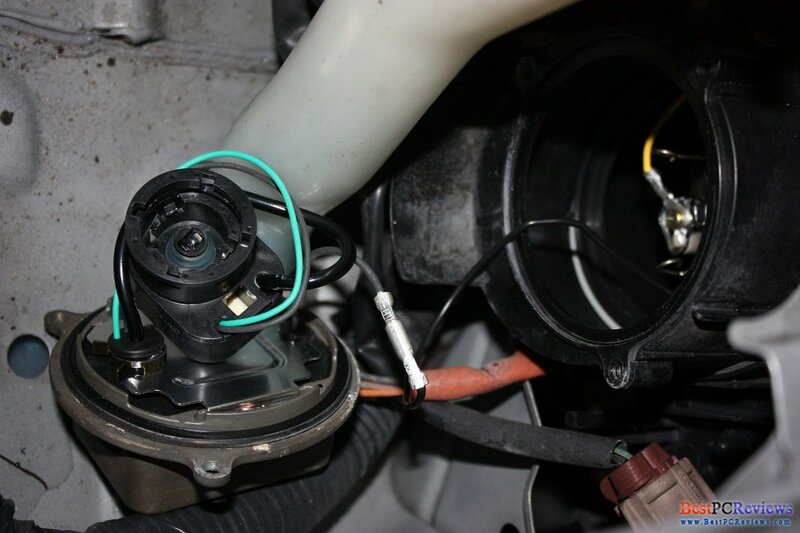 Take out two screws on the top of the headlight. The next part is a little complicated. 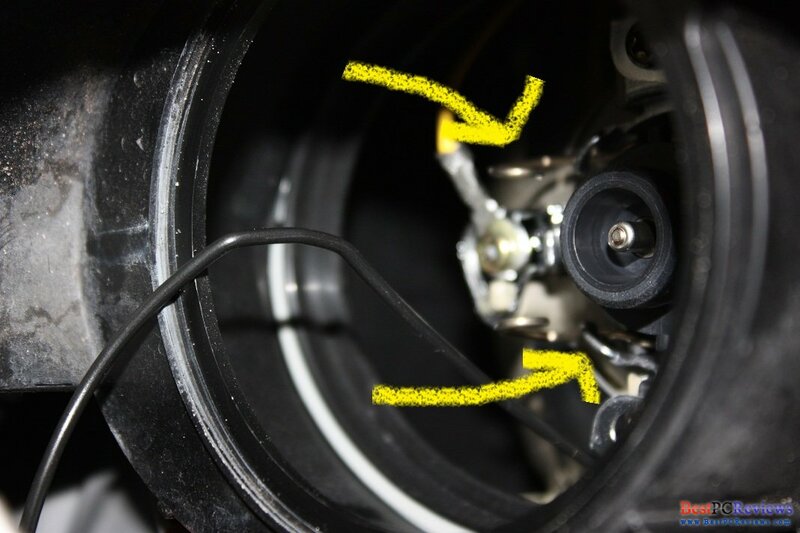 The bottom screw is under the headlight. 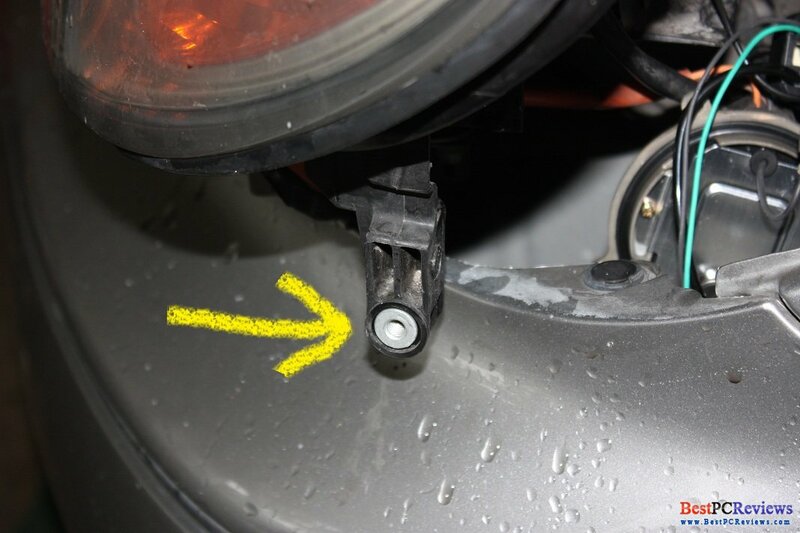 To get to it, you must remove three screws under your car. After you take them out, you can access the last screw that needs to be taken out. After all screws are out, you can pull the headlight out. You won’t be able to pull it out completely, but instead just about 4 inch away from your car. 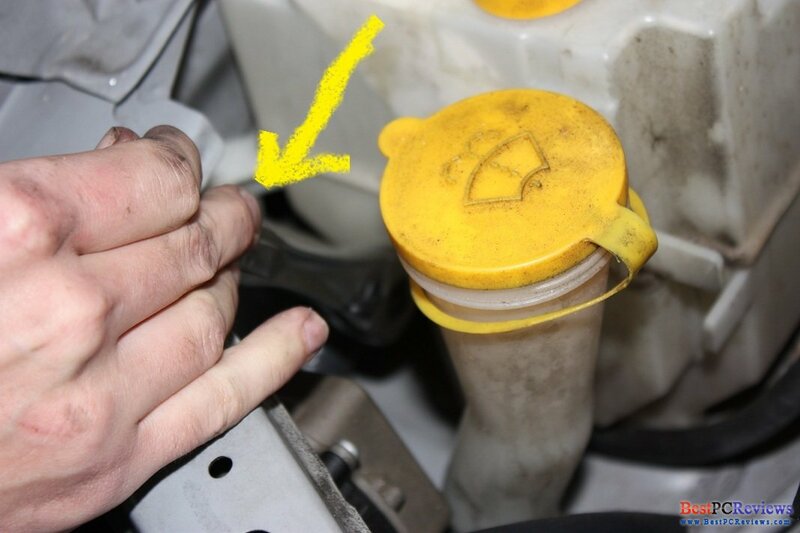 This will allow you to take cover out of headlight. Take three screws out of the cover and then turn the cover counterclockwise and pull it back. 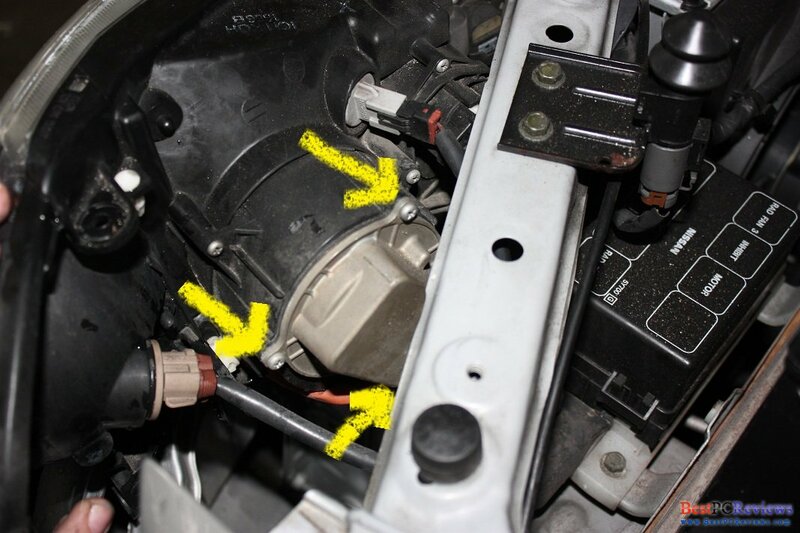 After the cover is out, you will see the bulb socket. To take it out you need to push on it and turn it counterclockwise. 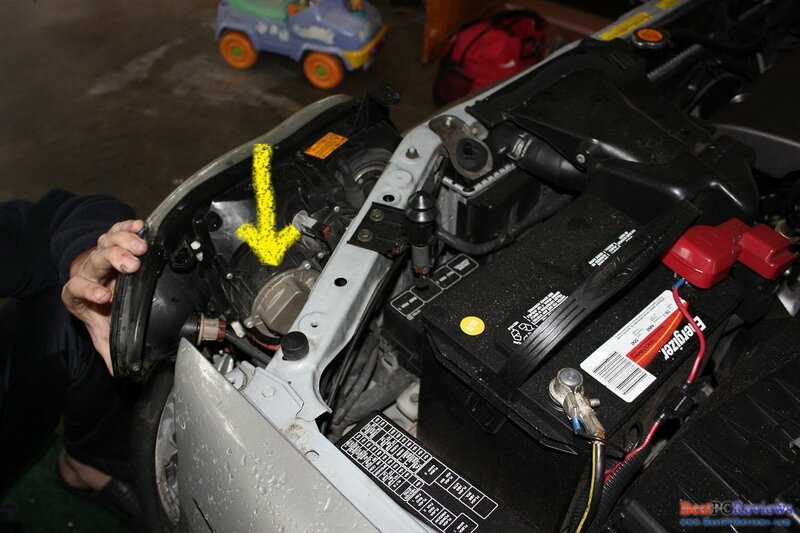 After bulb socket is removed, you will see the bulb secured with restraining pin. It’s hard to write on how to unlock the pins, but if you will see how the restraining pins are placed, you will understand how to unlock it. After you take the restraining pins out of the way, remove the used bulb. Take your new bulb, which might be in the shielded box. Now very important part, don’t touch the glass part of the bulb with your bare hands. 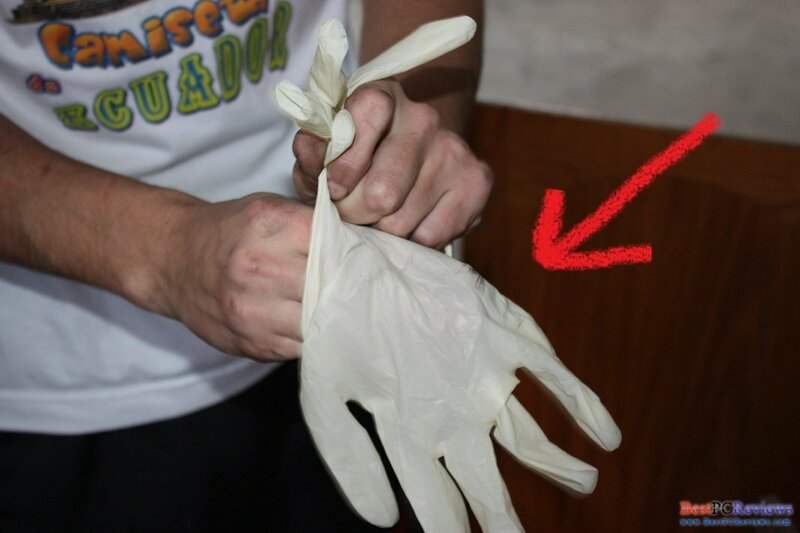 I would recommend using medical gloves just as a precaution. If your bulbs came with the shield cover, take the cover out and just use bulb. Put in the headlight assembly. 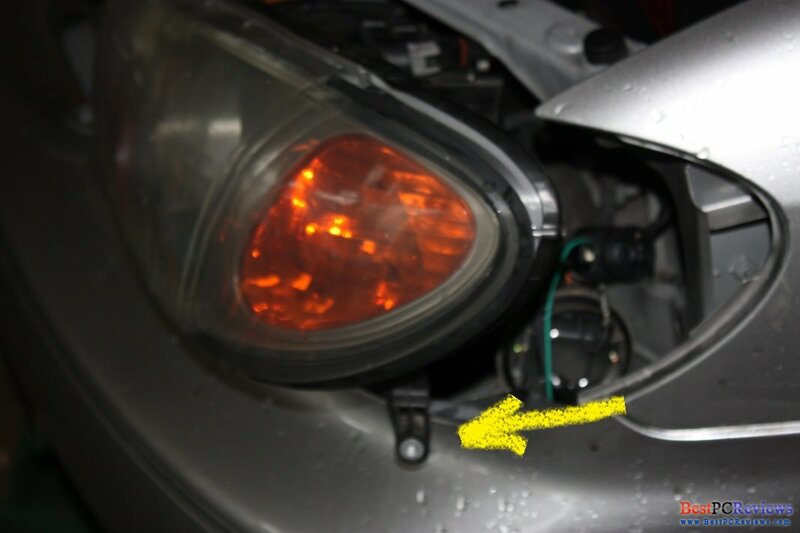 On my car the part of the bulb that has stick parallel to the bulb went on the bottom part of the headlight. You might have to play around with the bulb a little bit to make sure the bulb fits in securely. Put on the bulb the restraining pins. 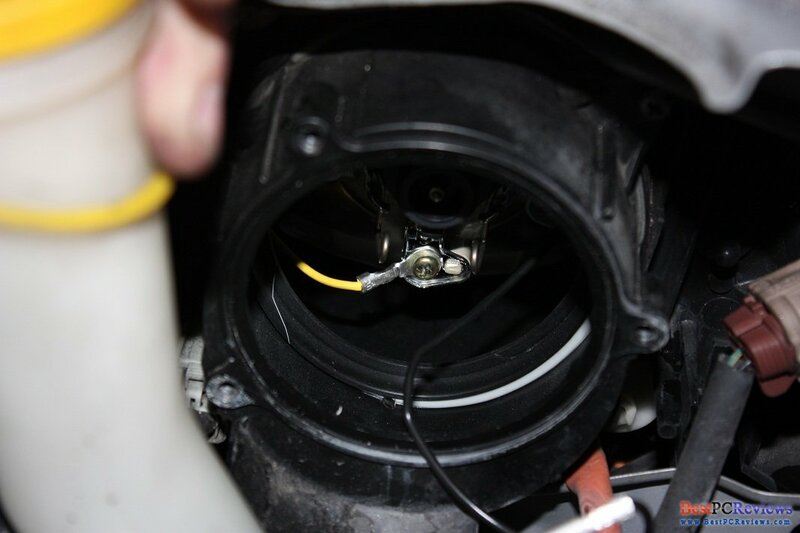 Put the bulb socket back on by pushing it and turning it clockwise. Now put cover back on by turning it clockwise and secure it with 3 screws. Now it’s time to put the headlight back in the place. 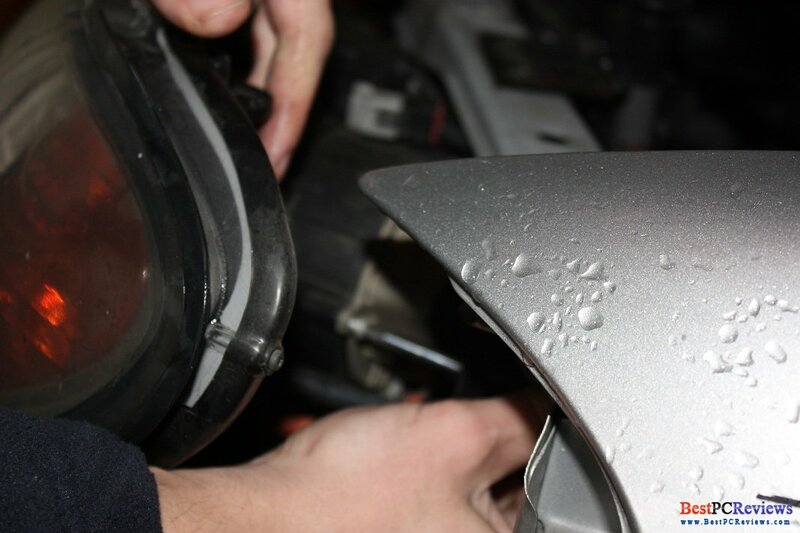 Once you do that, secure the headlight with two screws that go on top of the headlight. 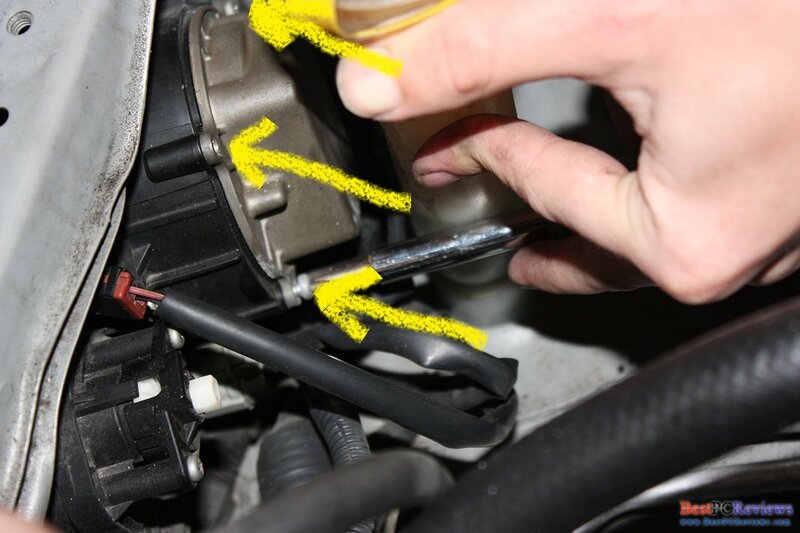 It’s your call whether you want to put in the screw at the bottom of the headlight. The two screws on top will hold the headlight just fine, but I still decided to put the bottom screw back on anyways as the H.I.D. bulbs should last over five years anyway. 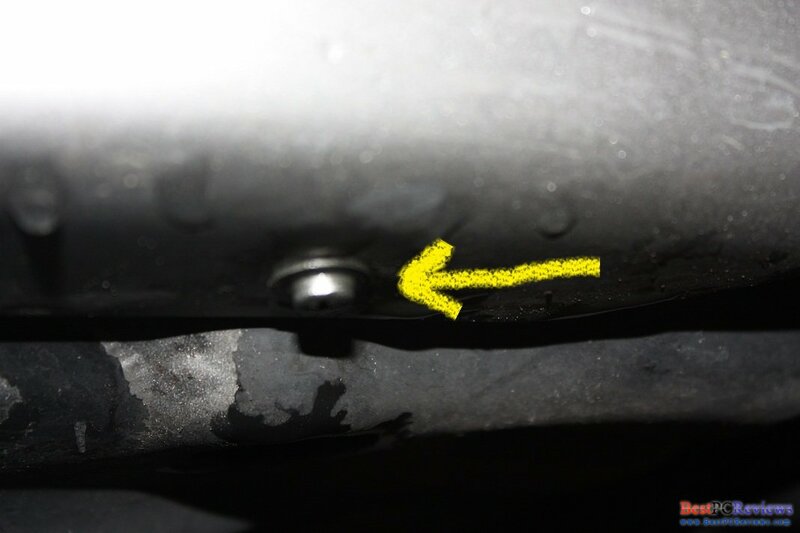 So if you decided to put on last screw, put in on by accessing to it from under the car. 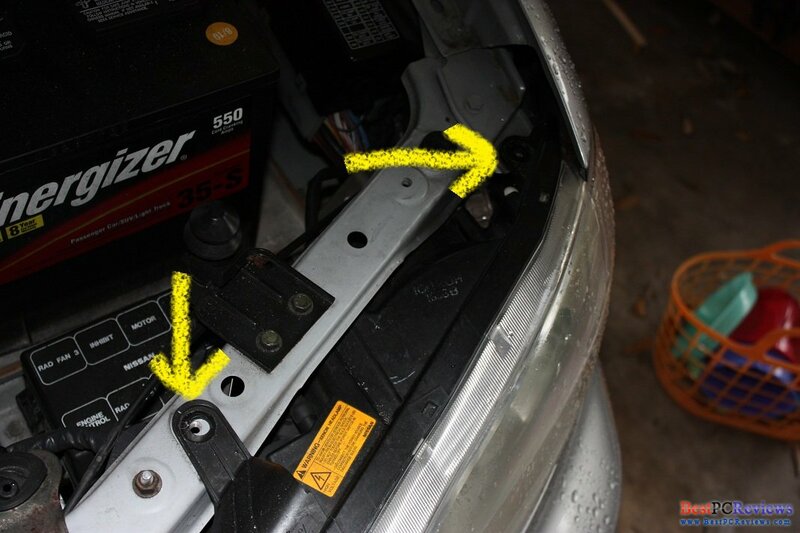 Don’t forget to secure the cover that goes under the car with three screws you used before. Now it’s time to change the passenger side bulb. If it will make you feel better, the driver’s side bulb was a lot harder to replace. 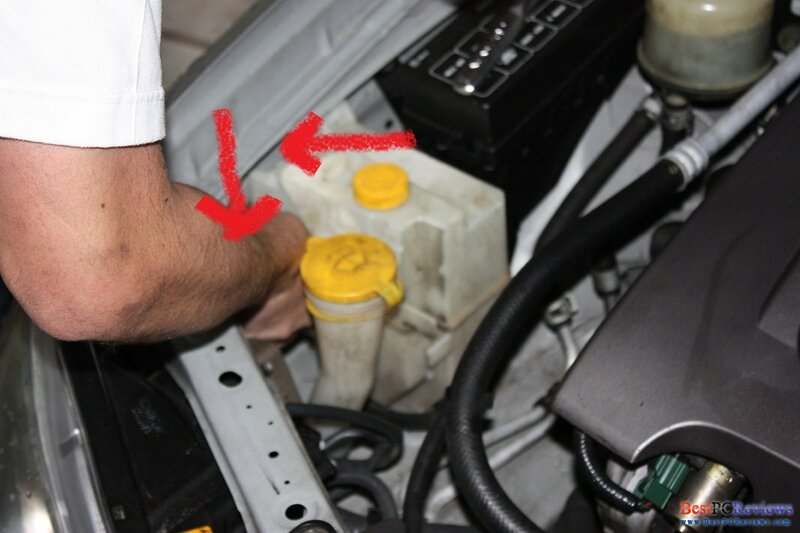 To replace the bulb on passenger side, you need to remove the engine coolant white box. There are two screws. One of them is at the top of the box and another one is on the side of the same box. 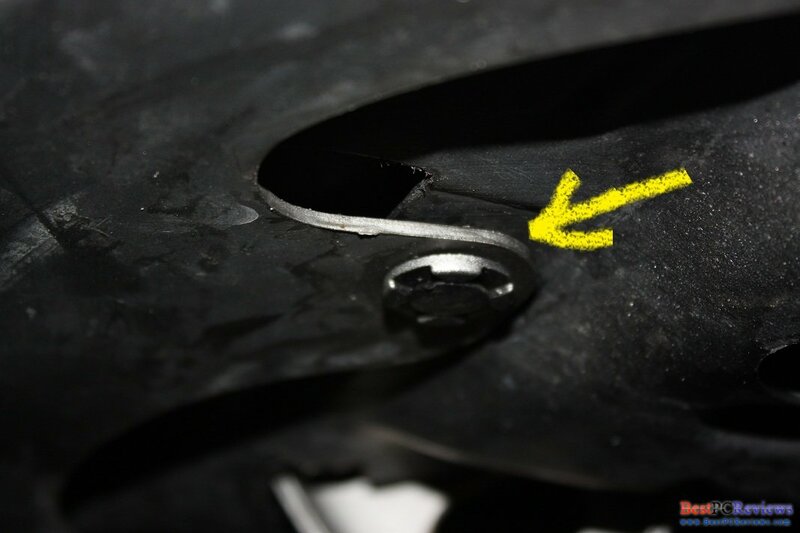 Once that is removed, you can remove three screws on the cover of the headlight. 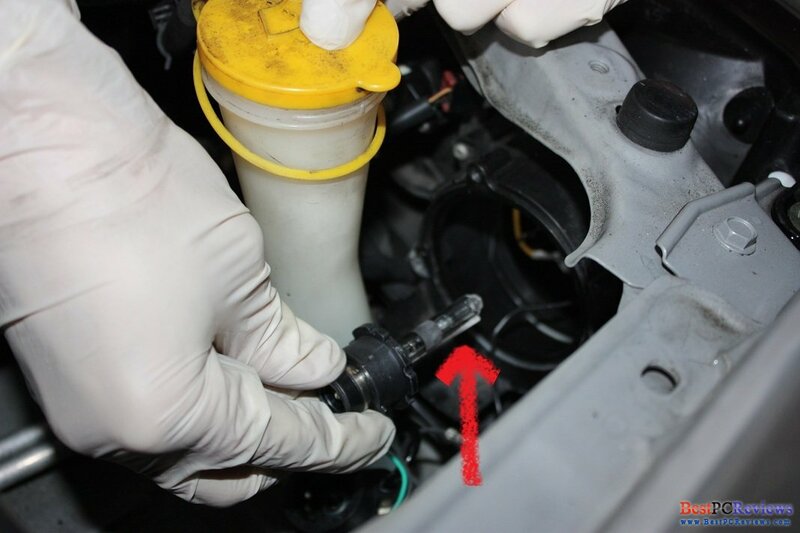 It might be little hard to take out one or two screws, but you can push around the wiper washer fluid white plastic that is right next to the cover. After all screws are out, turn the cover counter clockwise to take it out. 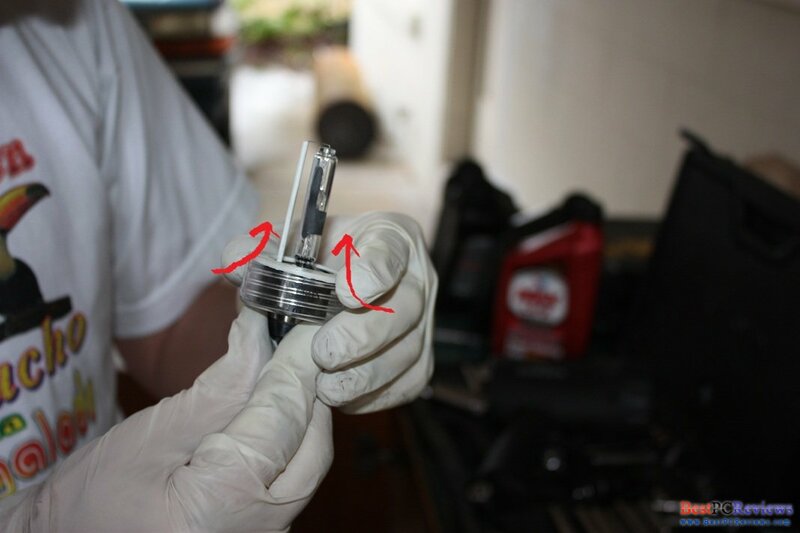 Then you will access to the bulb socket that needs to be pushed and removed counter clockwise. Then you will see the bulb secured by restraining pins. Take the pins out of the way and remove the bulb. Put new bulb in without touching the glass part of the bulb. You might have to move it around to make sure it goes in and stays in securely. 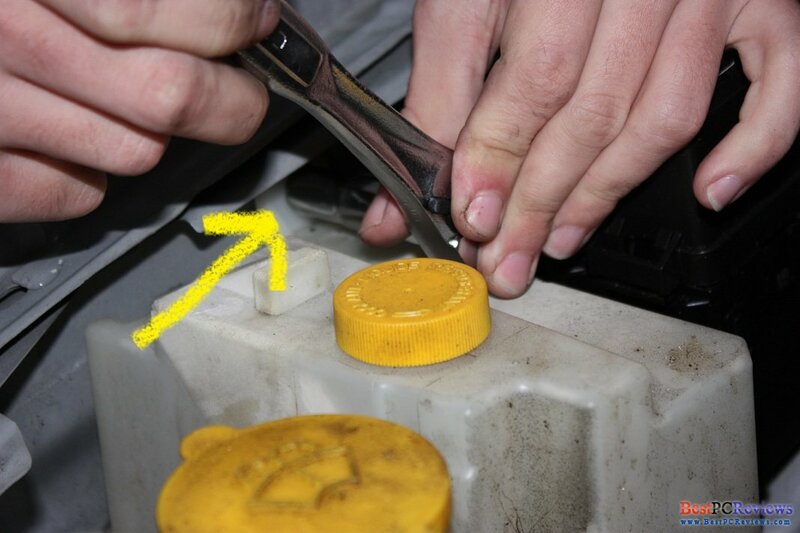 Then attach restraining pins followed by bulb socket that needs to be pushed and turned clockwise. Then put on the cover turning it clockwise. Secure the cover with three screws. 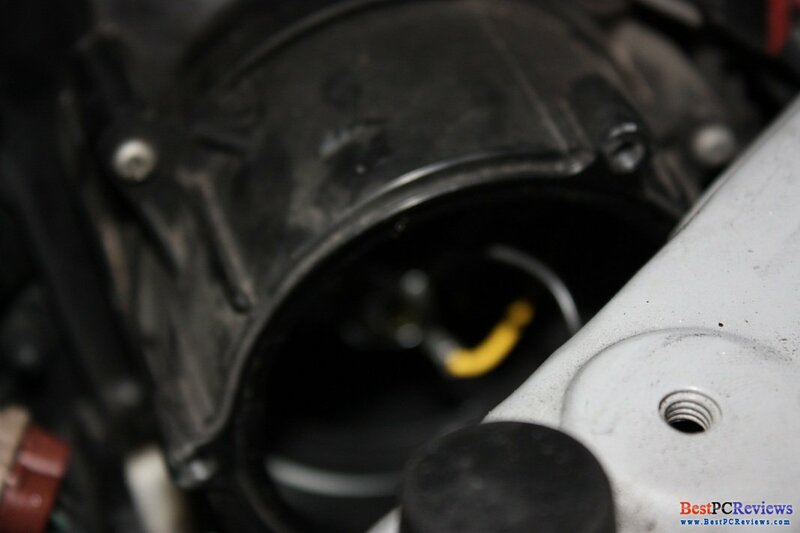 Put back the engine coolant white box, securing it with two screws: one goes on a side and one on top. After that, connect your negative cable back on the battery’s negative terminal. Turn on your headlights and double check that they are working. That’s it, you are done! You are more than welcome to put this guide on any site as long as direct link to the original source is posted.